When people look at the culinary scene in Vancouver, there are the usual suspects such as Bishop's, Blue Water, Cioppino's, CinCin, Il Giardino and Market. However, the one place that most tourists end up lining up for is the infamous Japadog. That's right, our gastronomical legacy (for now) happens to be a hot dog cart. Yup, we are known for tubes of mystery meat topped with Japanese ingredients served roadside whether it rains or shines (mostly rain unfortunately...) Hey, don't laugh. 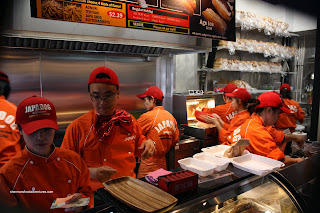 When the Olympics were here, Japadog got worldwide exposure and literally captured the imagination of many visit ors. Watch the franchise expand all over North America! But first things first. 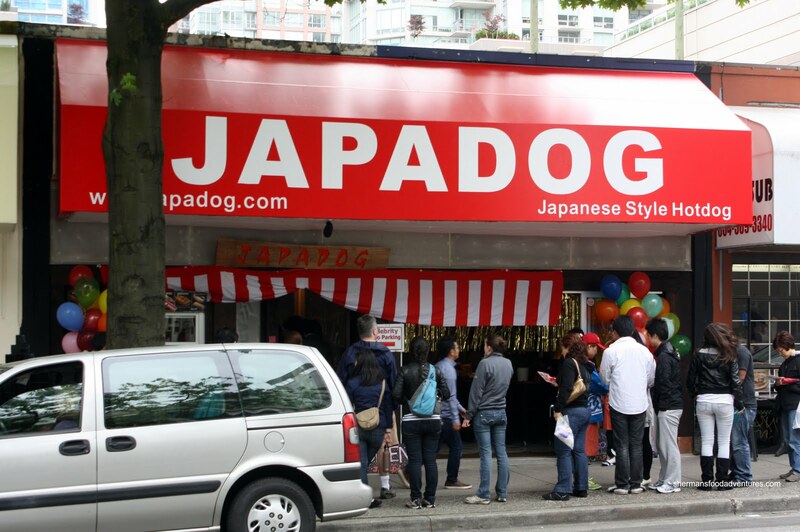 The Japadog store located on Robson near Richards has been a long time coming. However, it was an epic fail that it did not open prior to the Olympics since that part of Robson became the hub of activity. Imagine the money they could've made! No matter, they did pretty well at their cart locations despite this. 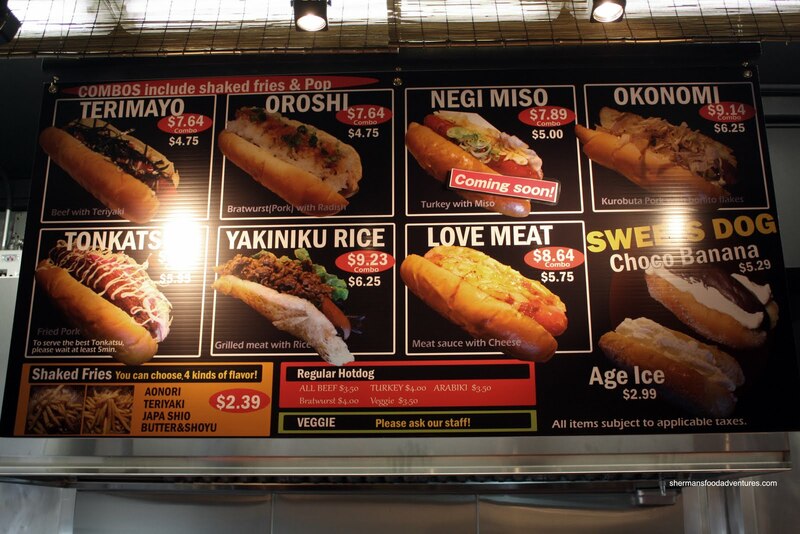 Finally, after what has seemed like an eternity, Japadog, the store, has gone live. Early last year, I had visited the original Japadog cart on the corner of Burrard and Smythe in front of the Sutton Place Hotel. I gave both the Terimayo and Okonomi a try. As much as I wanted to dismiss it as merely a dressed-up hot dog, I really liked it (especially the Terimayo). Something about the combination of Japanese ingredients combined with the lowly hot dog made it work. 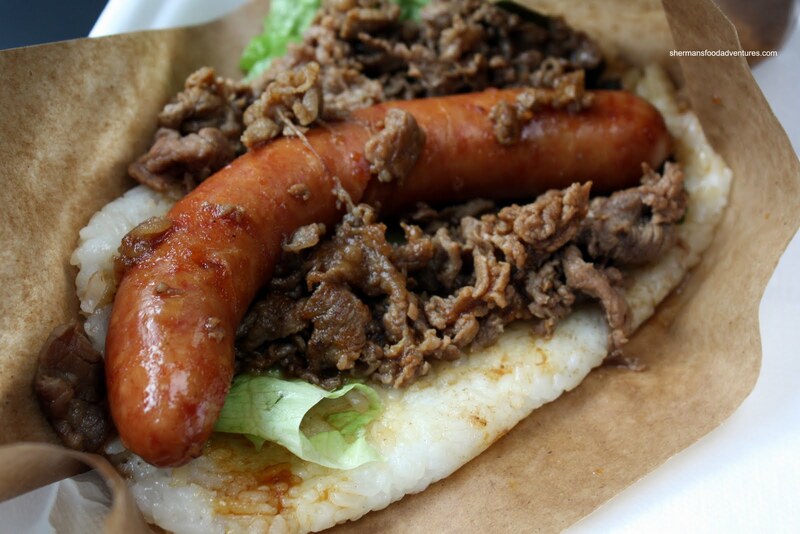 A subsequent visit yielded the Misomayo and although it was good too, the Terimayo held a place in my heart. Today, I braved the threat of a lineup to give some of the new items at the Japadog store a go. There was a small lineup and it only took about 10 minutes before I was in. 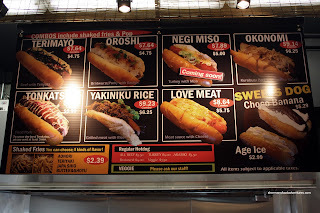 There were a few items on the menu that piqued my interest including the Love Meat; but honestly, it wasn't Japanese enough for me to try (despite its easy to ridicule name...). I settled on 2 items with the first being the Tonkatsu. 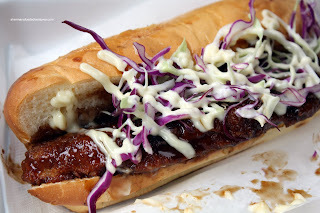 Much like the name implies, it is a fried piece of pork slathered in tonkatsu sauce topped off with shredded cabbage and mayo inside a soft roll. Well, I liked this one. How could you not? Look at it. It was crispy, saucy with a nice crunch and smooth mayo. I wasn't as enthused with the Yakiniku which is a hot dog topped with beef sandwiched in between a "rice" bun. It wasn't exactly the easiest thing to eat with things falling out all over the place. The sauce made it even messier as the rice did not hold up. The rice itself was somewhere between sticky rice and sushi rice. I did like the hot dog itself. It was quite meaty and had a nice snap. The whole thing didn't taste bad per se; it would be best eaten with a knife and fork. 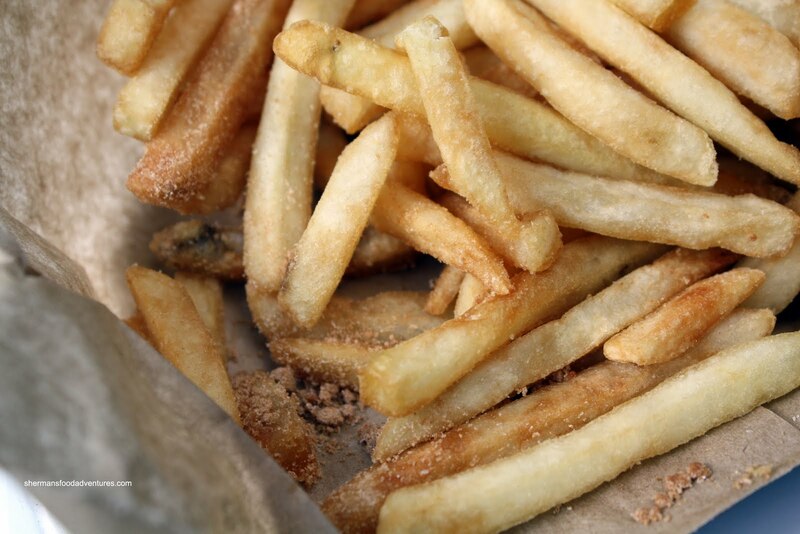 Another new item on the menu is the addition of fries. These "Shaked Fries" are exactly that. Fresh from the fryer, they are placed in a paper bag and shook with the selected seasoning. Choices include Aonori, Teriyaki, Japa Shio and Butter & Shoyu. I went for the latter. Although the seasoning itself was pretty flavourful and unique, the fries were quite average. They were very generic and lacked any real crunchiness despite being crispy (if that makes any sense). Depending on your personal preferences, the new items will either be a hit or a miss. However, they have the favourites on the menu which will still attract new and old customers. At the very least now, people don't have to stand out in the rain (unless the line is long) and they actually have somewhere to eat it other than the sidewalk. James, in terms of the new items and the fries, it is moving away from what made Japadog successful in the first place. However, I think it'll still make money as you said. I guess it depends on the rent they're paying on the space. Somebody needs to do something about sky-high rents here in Vancouver! Want good, cheap food? Lower rent, then the people who are truly passionate about making food can do their thing. . .Maybe finally we'll have a bunch of small places serving that one great thing. . .
JS is right. Doing business in Vancouver is really expensive. Gotta love the HST coming in too! Phyllis, just move back already! I guess when the costs keep going up like this, with no corresponding increase in population to offset said costs, independents/mom-and-pops will be squeezed out of business pretty soon. In which case, the whole scenario kinda depresses the heck out of me when I think all we'll be left with are chain restaurants and trendy, hipster-ish ones, mediocre, overpriced, and more often than not, both. Oh well. Que sera sera.